Perhaps I'm cynical, but it seems that PTSD has become a bit of a cop-out lately. Don't get me wrong--I don't doubt that it exists! I don't doubt that returning soldiers, abuse survivors, and others who have faced unspeakable tragedies or trials may suffer from it, but I've heard of many people claim to suffer from it after having vague symptoms following a somewhat (but not terribly) distressing episode. That being said, I think Dunbar has done a great thing with this book--she really dives into what it is like to suffer from PTSD. Make no mistake about it, Gordie suffers from full-blown PTSD after a truly terrible tragedy. Unfortunately for Gordie, his life seems to be taking a turn for the worse. He has found a stable living situation with his half-brother and his half-brother's father, when his own biological father--the person he blames for his situation--turns up again after 5 years and wants to be a part of his life. Dunbar creates a fascinating character with Gordie and illustrates his PTSD with terrifying detail. I don't know if Dunbar herself is a sufferer, but Gordie's pain is incredibly realistic. 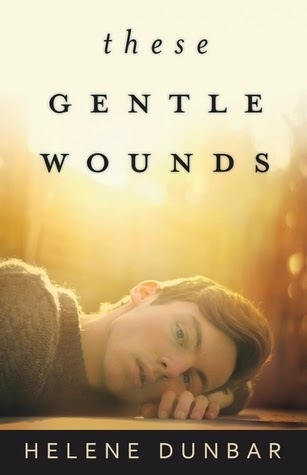 I know that PTSD is different for everyone and Gordie's experience may not be "typical," but it does give the reader an insight into the pain of PTSD. And, added to all this, Gordie is 15 and that is not an easy age. On top of his struggles and the stress of his father wanting to re-enter his life, Gordie starts dabbling into the world of relationships. This is another area that Dunbar treats with care and great success. So many YA books that include romance are written from the female point of view that it was a nice change to see one from a male perspective. There were some details, mostly dealing with the legal side of things, that I questioned in this book. But, other than that, I found this to be a bittersweet read that I'd recommend to most anyone.